During pregnancy, it’s always reassuring to know that your baby is safe and happy in the womb. There are many things you can do to check the health of your baby, and one of them is listening to your baby’s heartbeat via a fetal doppler. This unique device allows you to check the heartbeat of your child at home, without the help of a nurse or doctor. In this article, we’ll give you tons of helpful information to help you shop for a fetal doppler, and we’ll also review some of the best fetal dopplers available. Best Fetal Dopplers1. Wusic Heartbeat Baby Moniter2. 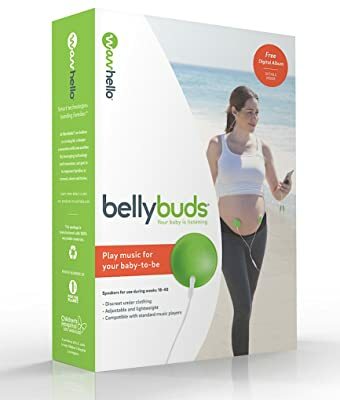 Belly Buds Pregnancy Baby Headphones3. Lansor Pocket Baby MonitorWhat is a Fetal Doppler?Are Fetal Dopplers Safe to Use at Home? There are many fetal dopplers currently on the market that you can buy and use at home. Some are much more effective than others. This is a very easy to use device that will allow you to monitor your baby’s heartbeat very easily. It is small, roughly the size of your computer mouse, and comes with two headphone jacks so that you and your partner can both listen to your baby’s heartbeat. It has a simple power switch and you can control the volume with the dial on the side. It also comes with a lullaby album that will sing to your baby. One of the downsides to this product is that it does not come with a display, so it does not provide as much detail as traditional fetal dopplers. One of the most useful and touching features is the ability to record the sounds your baby makes in the womb and store them on the computer. That way, you can go back and listen whenever you want, and you can also share the special moment with friends and family. The device is also very easy to use - the design fits easily into your hand, and you can easily move it around to detect your baby’s heartbeat. 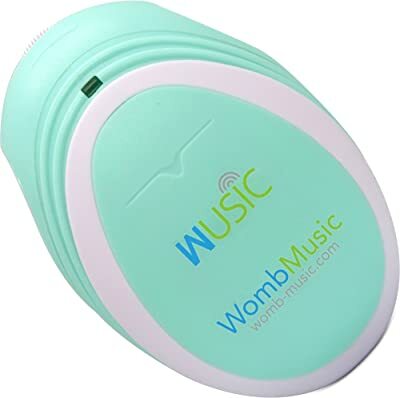 The sound quality on this device is also very, very good, so even if you are using it for the first time, you will be able to clearly hear the sounds in your womb and maybe even detect the baby’s heartbeat! You will need to purchase doppler gel separately in order to use this product. This is a lightweight device that allows you to hear the noises your baby makes, and you can share sounds with your little one as well. There are two small, lightweight adhesive pads that you apply to your stomach, and then you can listen to the noises your baby makes on your phone using their app. You can also digitally download free content, such as music and stories, to play to your baby. You can even record your voice and share it directly with them in the womb. One of the best things about this device is that it is extremely portable, so you can take it with you throughout the day. The adhesives also fit under clothing and do not require doppler gel. A downside is that once they are on, it’s not convenient to move them around to find your baby’s heartbeat or other noises. This means it may not be the best choice if you are concerned with finding the baby’s heartbeat. However, this device is extremely useful if you want to feel like you are communicating with your baby in real time. 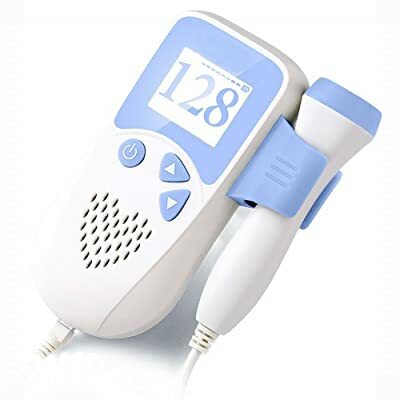 This fetal doppler is ideal for those who want to replicate the experience you might have listening to your baby’s heartbeat in a clinic at home. The product has a large, clear speaker as well as a display that shows your baby’s heartbeat. You can easily control the volume on this device by selecting the up or down buttons. The probe is highly sensitive when used correctly with doppler gel, which is included in the purchase. Although this fetal doppler is slightly larger than the other products listed here, it is still relatively compact and portable. It has a sweet white and pink color palette that makes the produce look a little more friendly and less medical. It can be used with headphones, or you can choose to just listen to the noises your baby makes out loud. It does take some practice to use, but once you’ve detected the heart rate once, it’s easier to find it again. A fetal doppler is a device that you can use to check your baby’s heartbeat. It typically consists of a display with a keyboard as well as a probe that is attached with a cord. This device uses the Doppler effect to detect the baby’s heartbeat, hence the name. It sends ultrasound waves towards the baby, and then the baby’s heartbeat is reverberated back to it. You can listen to your baby’s heartbeat with headphones, and the heart rate will also show on the display of the machine. Are Fetal Dopplers Safe to Use at Home? In the past, fetal dopplers were only used in hospitals and doctor’s offices by trained professionals. However, this has changed now that technology has evolved. Many companies make fetal dopplers that are easy to use to listen to your baby’s heartbeat. We will review the best versions of these later on in the article. There aren’t any current studies showing the effects of repeated ultrasound waves on fetal development, so use should be limited to just a few times during your pregnancy. It is also important to note that if you are not a trained medical professional, it may be difficult to actually find your baby’s heartbeat. Be aware that it may take some time to find the heartbeat. If you have any concerns, you should always consult your OB/GYN right away. How Do I Use a Fetal Doppler? Angle the probe downwards towards your pubic bone, and then slowly move it across the lower abdomen until you pick up the heart rate. It is important to move very slowly while you do this, as the heartbeat may be faint and hard to hear right away, particularly in early pregnancy. If you drag the doppler or apply too much pressure, you will likely just pick up static, making it more difficult to find the heartbeat. It is recommended that these sessions be shorter than 10 minutes for the health and safety of you and the baby. You should also wait until after your first trimester to start using a fetal doppler. What Should I Look For in a Fetal Doppler? One of the things that is most helpful to have in a fetal doppler is a good display. It should be clear and easy to understand so that you know exactly what your baby’s heart rate is. Some displays also display a sonogram of the heart rate. it is important that your fetal doppler be clear and easy to use. The controls should be straightforward, with large buttons that are easy to press. Finally, it’s important to have a probe that’s effective and comfortable on your body. The probe should hold the gel and distribute it evenly, without making too much of a mess. Overall, if you are interested in a fetal doppler, all of the options listed here are effective. Each has their own pros and cons, so the option you choose will be dependent on what your goals are when it comes to listening to your baby. The Lansor and Wusic dopplers are effective for finding the baby’s heartbeat, and the Belly Buds are great if you want to be able to communicate with your baby too.